The national promotional agency for Canada’s flax industry plans to move forward without a bricks-and-mortar office starting next month. The Flax Council of Canada announced Monday its downtown Winnipeg office, which it shares with the Manitoba Flax Growers Association, will close effective Jan. 31. Going forward, the council said it will “continue to operate on a reduced service basis.” Details on how the council will do so are still being discussed, council chairman Brian Johnson told Manitoba Co-operator reporter Allan Dawson on Monday. The council’s staff today include financial administrator Maureen Jordan, executive assistant Monika Haley and, most recently, extension agronomist Rachel Evans, who was brought on full-time in September 2015. The council in July announced the retirement of Don Kerr, its president since 2014, and hasn’t yet named a replacement. The Flax Council of Canada has operated since 1986, promoting the “advancement of Canadian flax and flax products” and the crop’s nutritional and industrial uses in domestic and export markets. Funding for the council has declined with a drop in Canadian flax production and sales, Johnson told the Co-operator. The council is funded through a voluntary levy on flax sales remitted by Canadian flax sellers, he said, adding that not all sellers contribute. The Manitoba Flax Growers Association and Saskatchewan Flax Development Commission, which represent flax farmers in their respective provinces, also contribute to specific council projects aimed at boosting flax sales. “Over the course of the past year, the formation of a combined oilseed council was thoroughly discussed” at the request of some council members, Johnson said in Monday’s release. Johnson is a general manager for Manitoba flax seed producer and council levy contributor S.S. Johnson Seeds. 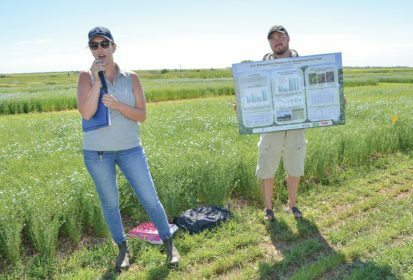 “Further dialogue will be needed to see what opportunities may lay ahead as the flax industry decides the merit of a national organization,” the council said Monday. The council since 2013 has managed over $6.2 million in research and market development programming, with support from Agriculture and Agri-Food Canada and the agriculture ministries and its affiliated flax grower associations in both Saskatchewan and Manitoba. The council noted its “key role” in managing the fallout from the 2009 discovery of genetically-modified Triffid flax seed in shipments to the European Union, a discovery which shut the door on what had been the largest market for Canadian flax exports. The council reiterated Monday it had put up financial support toward “significant” testing protocols to help remove Triffid from the Canadian flax seed supply. The council has also succeeded in helping to get the word out on the health benefits of flax consumption and that will continue, as will the council’s website, Johnson said, pointing to increased flax in breads, power bars and omega-3 eggs. Canada’s flax growers harvested an estimated 1.03 million flax acres in 2017, up from about 850,000 in 2016 but down from 1.595 million in 2015.